As the staff of the magazine Karabuk Kulliye, we interviewed the manager of the Institute, Associate Professor Dr. Yavuz Sun. The information we acquired during the interview helped us realize how important it was to found an institute of iron and steel in a city where iron and steel industry is intense like Karabuk. The equipments and the personnel who conduct tests are so qualified that everyone admires them. Moreover, each of the personnel that conduct tests is an assistant doing a doctorate thesis in iron and steel field. During the interview, the manager of the Institute- Associate Professor Dr. Yavuz Sun- explained us in details how important the institute is for Karabuk. The manager stated that the Iron and Steel Institute of Karabuk University is a foundation which represents the collaboration of public, university and industry; saying that the building was constructed by the support of KARDEMIR, and the equipments in the institute were provided thanks to a substructure project held by the Ministry of Development. Located in an indoor area which is about 8000 square meters, the institute has an infrastructure available for the iron and steel industry. Furthermore, provided that the necessary devices are supplied, the staff have such a capacity that they will be able to produce and test things in not only the iron and steel industry such as any metal material but also products used in automative and defense industry, and even the materials used in the space industry. There are three main features that bring the Iron and Steel Institution forward. One of these features is that it is internationally accredited. 18 tests that have been carried out in our institution are internationally accredited. The final reports of these tests are valid in the whole world. In other words, if the tests are conducted in an accredited institution, the final reports that the institution presents are acceptable all over the world. It is not an easy thing to be accredited. We put a lot of effort to be accredited for nearly one year. Furthermore, getting the accreditation certificate is not the end of the process. Every study that is conducted in one year is controlled by the staff of TÜRKAK who come and visit us annually. At the end of the visit, if the evaluation shows that the institution still has the qualifications required to be accredited, the institution is considered to continue to keep the title ‘accredited’. It is our second year now. We were first entitled to have accreditation in the year 2015. Also, we have almost 20 laboratories that are available and active to be used, and they all have the İSO 9001 certificate. Upon examining Turkey in terms of research and development centers, it is clearly seen that these centers are located in some specific regions. Our institution is different from those in two important aspects. Our institution was specifically founded to appeal to the iron and steel industry, and all the personnel who run the tests are assistants who have been doing a doctorate. They have the capacity to run the tests correctly and also to interpret them. Most of them graduated from the outstanding technical universities in our country, and some of them completed their bachelor’s and master’s degrees abroad. There are also some personnel who have been to abroad to get a training on equipments. It is also essential to state that the confirmation of the final reports on the tests that are carried out is given by the academicians / faculty members who completed their doctorate in those fields after they control and confirm the tests. Kardemir had had some important tests conducted in İTÜ or ODTÜ by sending the tests there until our institution was founded. Now, all the tests of Kardemir are conducted in the laboratories of our institution which has the İSO and TÜRKAK certificates, so there is no need to send the tests to another city or university. Two important goals lie in the foundation of the Iron and Steel Institution. The first goal is to serve the iron and steel industry nationally and internationally. Hence, the first goal of ours also helps us carry out every test that Kardemir – one of the most important foundations of iron and steel industry – needs to be conducted in Karabük. The second aim is to make a contribution to the scientific studies that are done in the universities in our country. Kardemir has made a great contribution to both iron-steel industry and the scientific studies in the university by supporting the foundation of such an institution in Karabuk University in relation to university and industry cooperation. Among the most important tests that we carry out for Kardemir are residual stress, crack propagation, and fracture toughness tests. Kardemir has sold rails to very cold places like Siberia or very hot places like regions in Africa. We have the equipments and the capacity to conduct tests so that the rails can be used in both opposite conditions comfortably. The reports we give to Kardemir are valid everywhere. There is an important project on which Kardemir and we work cooperatively. Kardemir has been producing rails whose heads are hardened. The budget for this is high. We are coming to an end in this project. Karabuk University is a partner in the project. Thus, an important number of the tests regarding the project was conducted in our laboratories. Kardemir now is the factory to have produced rails whose heads are hardened. Kardemir has been producing rails for years, but it has not produced rails whose heads are hardened so far. There were few places which could produce rails whose heads are hardened, and there were not any places where could do it. Via the project that Kardemir started two and a half years ago, Kardemir produced those rails and got its technology. After that, National Railways of Republic of Turkey (TCDD) installed those rails in a region in Yozgat to test them. Now there are trains passing over them. The tests are still going on. The experiment period is six months. It has been one and a half month since the experiment period began. We also take part in the measurements and experiments. Personally, I believe there will be a great demand for that kind of rails both in and outside the country because this product has high added value. One of Kardemir’s important projects is to produce rail wheel using local resources. This is also going to happen in a few years. It will be the first. Hopefully, when Kardemir produces rail wheels, we will conduct their tests. The Iron and Steel Institution and MARGEM within it are places which aim to serve in the nation and international market. That is our main goal, but we also serve the Academy. There have been hundreds of theses of Master’s degree conducted in our institution, and there will be. Our institution has made efforts on an important number of theses of Master’s degree and Ph.D. that are being carried out in the fields of Science and Engineering. Many experiments related to these theses are conducted in our laboratories. There are also national and international publications, articles and patents derived from these dissertations. These things can not be measured materially. If it weren’t for this institution, the academicians would have to go to neighboring cities or TÜBİTAK in Gebze, ODTÜ in Ankara to improve their studies. To be able to do this, one needs a huge budget. Thus, it is obvious that the institution has made an important contribution to the nation and the academy. Karabuk University Iron and Steel Institution is one of the best samples of collaboration between university and industry. The aforementioned project on the rails whose heads are hardened that we run collaboratively with Kardemir is a project that can be taken as a sample in Turkey. That is not just our opinion, TCDD and Kardemir also agree that it is a good project. This project – when it is fully completed and when the rails are started to be used by TCDD – might be presented to our President of the Republic as a sample of collaboration between university and industry. Also, we can get the support of TÜBİTAK, the Ministry of Science, Industry, and Technology, and foundations like KOSGEB by writing projects to them. Moreover, we can collaborate with those companies which have projects regarding production and are keen to develop their projects on the development of their projects. We are currently serving twenty-two big foundations in Karabük and its surrounding. We are conducting the tests that these foundations need. Among these foundations are some located in the cities in West Black Sea. It is the iron and steel industry that we are serving now, but we can serve the whole metal sector. Teknokent which will be founded will definitely affect us positively on account of the fact that teknokent means the foundation of companies which can produce in or around the university. We can also do the tests that they need in our institution. Thanks to Teknokent, our faculty members, and the companies will be able to come together on a common ground. This way, new projects can arouse. Kardemir and Karabuk University visited one of the world’s biggest iron and steel productors, Pohang Iron and Steel Company, and the university, Pohang Science and Technology University. Our chancellor and the chief executive of Kardemir paid this visit together. The aim of the visit was to see the collaboration between university and industry in person and to get information on how it is put into practice. The relationship of these foundations in South Korea goes 30 – 40 years back. The extent to which they collaborate is unbelievable. 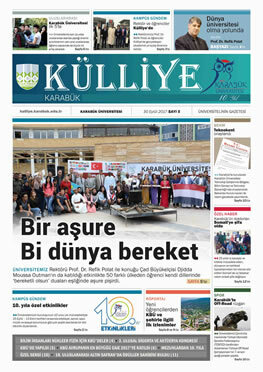 That is what our university and Kardemir are working on. Of course, this is a long process. We had the chance of coming together with lots of representatives from universities and companies during the 3rd International Symposium of Iron-Steel that takes place traditionally in our university. One of these representatives is the Turkish Standards Institute (TSE). We have been working with them for a long time. They carried out a search. It is really interesting. They tried to find out where there are laboratories like ours. In the end, they said, “Such a laboratory exists only in Karabuk, actually it is in a place where the sector is alive.” Namely, there are centers where the sector is not that alive. We have got a protocol with them. There are offers of projects for them to us. We buy the standard samples that are used in these centers from abroad. Can we produce these standard samples ourselves? We want to work on this together with them. I always tell my students this: 16 – 17 years ago, we said “We cannot finish the Bolu Tunnel. That place might end up being a place to store potatoes.” The Bolu Tunnel had not been constructed for long years. But now, there are 20 tunnels like the Bolu Tunnel in Turkey. Marmaray, the 3rd Bridge, the 3rd Airport, these are huge projects. To tell the truth, we took lots of technological steps in the last 20 years. Recently, I have read an article. It says Turkey has started to work on founding a place like NASA in the USA. A law draft about it has been proposed to the assembly. According to the law draft, the aims of it include: the determination of main politics and strategies of Turkey in the field of aeronautics and space; the application of these; the development of competitive industry that is not dependent on other countries; in accordance with the public welfare and national interests, the popularization of the use of space technology; the development of the scientific and technological basis in the field of aeronautics and space, and human resources; the improvement of capacity and ability. If something is on the agenda, we can see it come true in a short time. We could not imagine that we would produce the Altay tank or the unmanned aerial vehicle 15 years ago. In short, if the necessary conditions are provided, we have the personnel who will do the experiments of products of automative and defense industry along with the materials that are used in the space industry. I think these tests can be carried out in our institution when it is necessary.